Install low-flow taps. 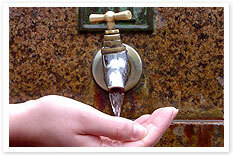 Reduce the amount of water coming out of your tap. It is that simple. Available from any hardware store. Dual flush toilets. Installing a dual flush toilet will allow you to use the appropriate amount of water to clear the toilet bowl. Another approach is to learn the mantra "if it's yellow let it mellow, if it's brown flush it down". Use the water twice. Connect up a hose to your washing machine so you can pump the water out to your garden. Make sure you use phosphorous-free detergent so that you don’t harm your soil or plants! Check the water rating. If you're about to buy a water-using product find out first how Water Efficiency Labelling and Standards (WELS) ratings can save you money and help the environment. It's simple - the more stars on the WELS label - the less water that product will use, and the more money you will save. Check out our Rebates and assistance page for a range of available rebates on water saving products. Some local councils also offer rebates for purchasing water saving devices. Contact your local council to find out.